Melrose Abbey was founded in 1136 by King David of Scotland, five miles from the ancient monastery where St Cuthbert lived in the 7th century. The 12th-century Melrose was run by the Cistercian monks, an order which became wealthy and influential in medieval England. This manuscript, the only surviving ancient copy of the Chronicle, begins with the year 735 up to 1270. Bound with it is a copy of the Chronicles of the English, a continuation of Matthew Paris by Rishanger, a monk of St Albans, up to 1279. The rest to 1306 is mostly copied from a history by Walsingham. 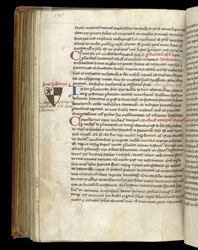 In the Chronicles of the English, major events are specially noted in the margin, usually with an inscription in red ink. Here the accession of Robert de Vere as Duke of Hibernia is recorded with a drawing of his heraldry.